Students preparing for their solo performance based on one of Rob Shetterly’s paintings. If you are a Maine Arts Education blog follower you know that I’ve included a handful of posts on Americans Who Tell the Truth and artist Robert Shetterly. The last post Americans Who Tell the Truth in Syracuse included information on the 238 portraits of Rob’s that were on display at Syracuse University. I followed up with Connie Carter who works with Rob visiting Maine schools who are using the paintings in multiple ways. I was curious how a higher education institute was tapping into this incredible body of work. Fortunately, it was a question that Rob and Connie asked as well and videos have been created on the topic. Raw footage for the most part that are posted on Vimeo can be found at the links below. Steve and Rob conversing about the Solo Creations course work. 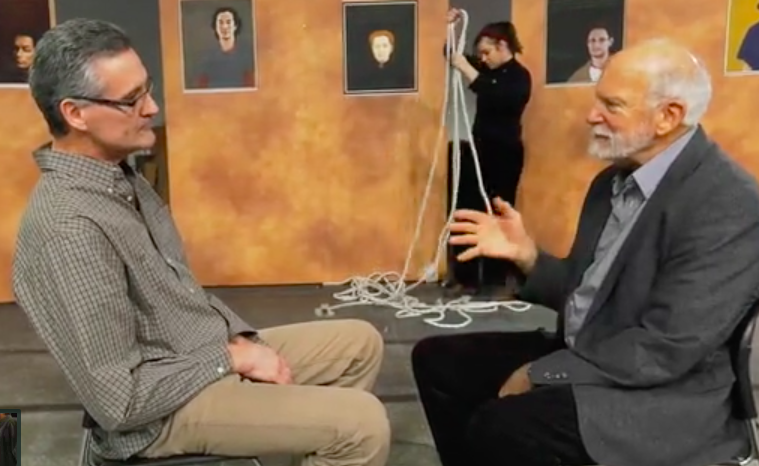 Jim Clark from the theater department at Syracuse University was interviewed and speaks very clearly about the power of the portraits for students in the creative arts and beyond. CLICK HERE to view the interview and use the password AWTTClark. The second video includes an incredible interview with Steve Cross, professor of Visual and Performing Arts at Syracuse University. He teaches a required course titled: Solo Creations that uses the portraits to explore ideas about creating a solo piece. 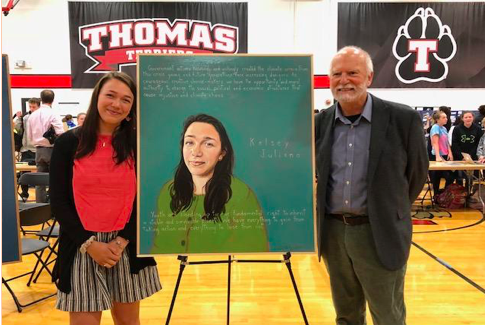 The video includes performances by a couple of his students so you can see the outcomes of the work with Mr. Shetterly’s paintings. CLICK HERE to view the interview with Steve and his students performances. Use the password AWTTCross. Americans Who Tell the Truth and MAMLE are excited to announce that the registration for the 2018-19 Samantha Smith Challenge (SSC) is now open! As we launch the fifth year of the Challenge, we are excited to know that middle school students across Maine will be tackling important issues and modeling for all of us what it means to be an engaged citizen. The Samantha Smith Challenge (SSC) is an American Who Tell the Truth (AWTT), MAMLE & Thomas College Initiative designed to build a bridge between the classroom and the world, teaching students to identify, study, and work to solve the challenges and problems they see around them in their communities. Participants will hear from past SSC participants and learn how to bring the Samantha Smith Challenge to their classrooms and help students use the curriculum to turn global concerns into positive action while connecting to standards. We are especially enthusiastic that this year’s SSC will focus on the different aspects of individual and group identities as students learn to become engaged, change-making citizens. We are asking SSC students to think first about their own identity, considering identities that, for the most part, are unchangeable — race, ethnicity, gender, age — and also those identities they can choose –beliefs, clothing styles, groups they join, issues they engage, etc. How do these characteristics affect expectations they have for themselves and expectations others have for them? Then, as they look around, in their community or across the state, nation, and world, think about these identities and expectations affect others. How does this combination of identify and expectation connect to the justice and equity issues they see? Mark your calendars for this year’s celebration which will be held on Monday, June 3, 2018. Besides having the opportunity to share important work on many social justice issues, there will be a great program that emphasizes how important youth activism is to our world. As in past years, Robert Shetterly and I will be available to do workshops with your students. It is always a highlight to meet your students and experience their energy for their chosen issues. We look forward to working with you and your students as you engage in the Fifth Samantha Smith Challenge! Please contact me if you have any questions or concerns. Tomorrow’s blog post is provided by a teacher whose classroom participated in the Samantha Smith Challenge. Last week I had the chance to meet with Connie Carter of Operation Breaking Stereotypes. Since 2002, Operation Breaking Stereotypes (OBS), a non-profit, service-based organization working with schools in Maine, Boston, and New York City to help students address ethnic, socio-economic, gender, and racial stereotypes through writing, reading, music, photography, and personal connections. We met with Aran and Robert Shetterly to talk about their work Americans Who Tell the Truth. (AWTT) Americans Who Tell the Truth = Models of Courageous Citizenship. AWTT is dedicated to the belief that a profound sense of citizenship is the only safeguard of democracy and the best defense of our social, economic, and environmental rights. Through portraits and stories of exemplary American citizens, both historical and contemporary, AWTT teaches the courage to act for the common good. Its powerful educational programs promote our country’s ideals, illuminate the necessary work of the present, and inspire hope in the future. You might know Rob Shetterly’s work. A handful of years ago Rob was at Haystack for the fall Maine Art Educators conference. I remember thinking “wow” what a difference this man is making in the world. He is able to select individuals (and paint them) who get to the heart of a topic in the most truthful and honest ways. His work really “speaks” and I think it would be a gift to have these paintings surround us in our living spaces every day. Rob’s son, Aran, is working with his Dad to bring the work into schools and educational settings in a more formal way. AWTTs new website is filled with information that you may find useful, certainly interesting. 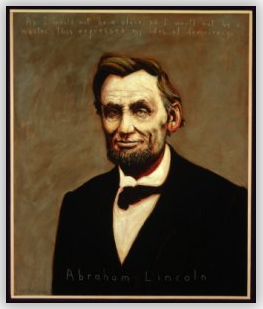 In the near future they will be offering regional professional development opportunities for educators to take a close up look at the paintings, the people in the paintings, and the teachers and perhaps students who have been fortunate to hear from Rob in classrooms across Maine. Aran, Rob, and Connie are in the process of planning these events. I am grateful to know that more students, teachers, and schools will have this opportunity in the near future. Watch for information on meartsed blog about these professional development opportunities and if you have questions please contact Aran at aran@americanswhotellthetruth.org. The excitement was intense and impressive at the annual Maine State Vocal Jazz Festival held at Ellsworth High School. 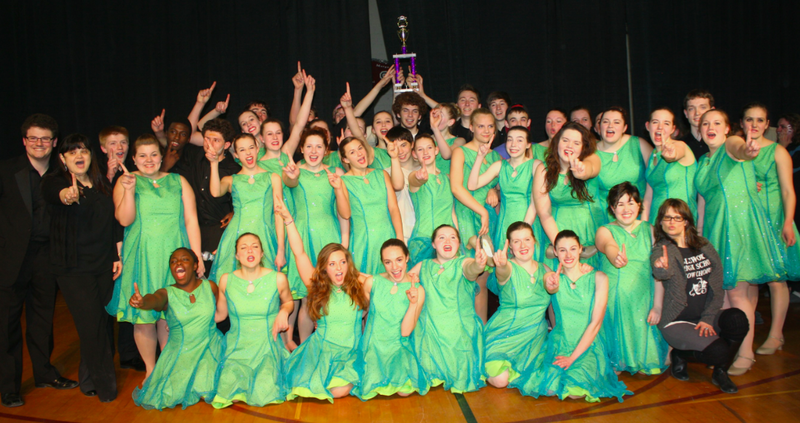 The Ellsworth High School Show Choir won the Division I State Championship at the event for the sixth time in the choir’s history and the third year in a row. They also received a “Gold Award” rating of 1 and received the “Outstanding Choreography” Award for the third year running as well. Special recognition for 1 rating performances in the solo category went to Tyler Small, Tyler Beardsley, Kassidy Jordan, Tim Follette, Blake Pattengale, Marissa Boynton, Lauren Barkhouse, Savannah Jackson, and show-stopping Melissa Wells. The choir presented “I Know Where I’ve Been: Twenty Years of EHS Show Choir” . The evening final performance may be found on You Tube. On Tuesday, April 10th, the Show Choir leaves for Orlando, Florida where they will be competing in Disney Festival and performing on the Waterside Stage in Downtown Disney. Congratulations and Good Luck!